A special order piece in the home of a collector. Of special note: Cast in chalkware in an antique German chocolate mold. 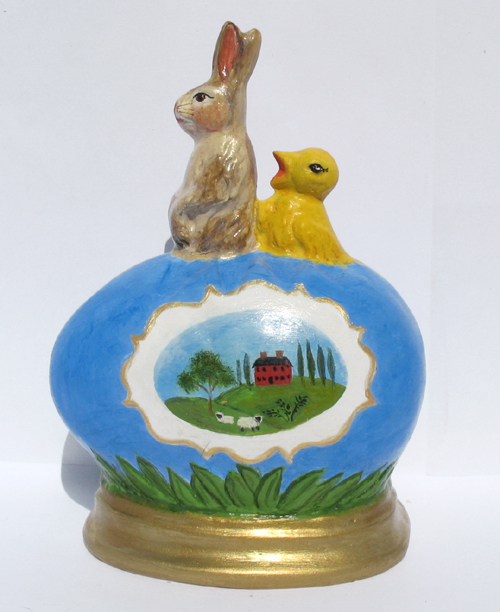 Peter Rabbit and his chickie friend are nestled inside a beautiful cobalt blue egg with a New England Folk Art scene. The rural scene, complete with grazing sheep, is replicated on the other side so that the piece can be displayed from either side. This one- of -a- kind piece measures 5 1/2 inches. signed "Bittersweet House Folk Art, K. Campbell, 2006, Sherborn, MA".